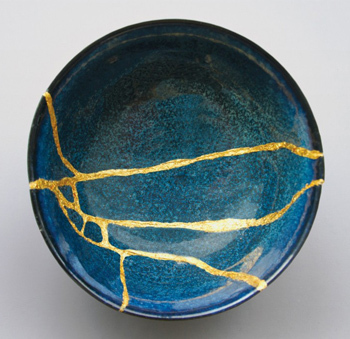 Our first contribution this month is a brief article on Kintsugi, the Japanese art of “gold joinery” or patching broken pottery with gold lacquer, repairing the brokenness in a way that makes the object even more beautiful for being broken. It is a long and laborious process which requires much patience and some gold. • Another new addition is Poimandres, the famous first treatise of the Corpus Hermeticum, source and inspiration for countless artistic, mystical and philosophical endevours over centuries of European and Mediterranean history. He changed his appearance, and in an instant everything was immediately opened to me. I saw an endless vision in which everything became light—clear and joyful—and in seeing the vision I came to love it. • Finally, an early article by Ananda Coomaraswamy introduces us to the subtle understanding of beauty as a state, a timeless communion between subject and object. The vision of beauty is spontaneous, in just the same sense as the inward light of the lover (bhakta). It is a state of grace that cannot be achieved by deliberate effort; though perhaps we can remove hindrances to its manifestation, for there are many witnesses that the secret of all art is to be found in self-forgetfulness.